This novel has the "It" factor - that indefinable thing that makes every page zing as it goes by. 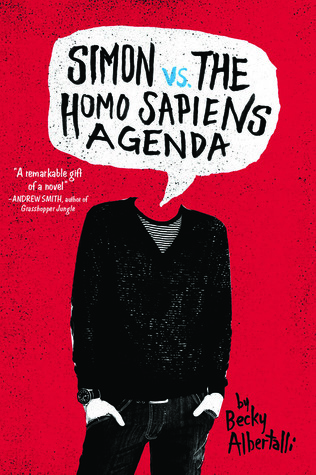 It is the perfect mixture of sweetness, substantive discussion of the difficulties of being a gay teenager and just a teenager, hilarity, and general fun. It is an issues book that entertains without preaching. 1. Simon - Someone I'd love to be friends with. A really nice guy, who doesn't always do the best thing but generally means to. Funny, awkward, geeky, romantic. What more can you want? 2. Simon's Friends and Family - Well rounded characters. Even those with little page time. Simon has healthy relationships with all of them, although everyone has ups and downs throughout the book. I particularly like that he has a close-knit family, which is often lacking in YA. 3. Simon and Blue - Their emails were a highlight of the book. Funny and flirty. They managed to unveil their true selves to each other and to the reader. It was a great example of how one's inner self is both different and similar to how one acts in public. 4. Blackmail - A great plot element, although it was awful for Simon. I loved that the blackmailer was a three dimensional character. His actions were reprehensible, but I also sorta understood why he did it. 5. Happy Book, Happy Ending - This is a great read if you're looking for a positive story. Even though Simon is being blackmailed and has to deal with coming out, the tone is always uplifting. Simon has a good life, with supportive people, and that will hopefully always be so. Plus, the ending is squeal-worthy! Recommendation: Buy, buy, absolutely buy! Yes, this book is amazing!! I adored Simon and Blue's emails so much :D I definitely agree that the author did a great job with all the secondary/minor characters because they all felt real, not just like people who pop up every now and again. Anyway, great review and I'm so glad you loved this book! I still have to read this book, have been hearing really great things about it but the whole idea of teenager boy just...not appealing to me somehow. I will try to read it in the future tho. Nice review! I just loved Simon! This has been one of my favorite books of the year! I have this one on my "need to read before the year is over" list. I'm just waiting to finish my old pile of books before adding more. I've heard nothing but rave reviews for it. Great review and I really like the new review format. Short and sweet. This book sounds amazing! Definitely adding it to my TBR!